How do you get from the formula to a picture? z->z²+1 z always starts out as zero, so let’s add the 0 in. 0->0²+1 the result is 1. There’s little point to continue this, it’s obvious the number will grow larger very fast. The result of Mandelbrots formula is that for c=1 as starting value, it goes towards infinity. All points that go towards infinity are NOT part of the Mandelbrot set. 1. Iteration 0->0²-1 result is -1, so we take -1 for z in the next iteration. So for c=-1 Mandelbrots formula doesn’t grow to infinity but oscillates between -1 and 0. All points that never go to infinity are part of the Mandelbrot-Set. Well, it is hard work to calculate this by hand and it would take years to manually calculate a detailed picture. We actually have calculated just 2 pixels of a Mandelbrot-Set image. A full-HD picture has 1920*1080 = 2.073.600 Pixels. So it’s no wonder the Mandelbrot -Set was only discovered after computers became fast enough. Note the 2 point we just calculated. c=+1 goes to infinity, so the pixel is outside the Mandelbrot-Set. Whereas c=-1 does not go to infinity, so it is part of the Mandelbrot-Set. This is a much more detailed rendering. This shows how the point c=-0,4+0,4i belongs to the Mandelbrot-Set. This shows how the point c=0.28+0.015i will head out to infinity after a few iterations and thus is not a part of the Mandelbrot-Set. For this simple explanation we’ll stick with the horizontal x-axis. For the vertical y-axis you need to understand imaginary numbers. To learn about them watch this video. To visually play around with different values of c use this nice tool. Remember the “iterations” from above? The iterations are the number of repetitions needed to find out if a starting value goes to infinity. With the second iteration it’s clear that the result will inevitably become larger and larger until infinity. So we can stop calculating and calculate the next pixel. For every single pixel of this image we calculate z->z²+c. All pixels with a result over 2 after one iteration are colored purple. Those over 2 after 2 iterations in a darker violet and those that are still smaller than 2 after the 3rd iteration are coloured black and are part of the Mandelbrot Set. After 4 iteration we begin to see the familiar shape emerging. After 6 iteration it becomes more obvious. Notice how the area with number 6 has the dark turquoise color. 16 Iterations, a clear view of the Mandelbrot-Set. But how about more details? Let's zoom into the white box. Enlarged detail - we're still at 16 Iterations. More details at 32 iteration. This means for every pixel in this image we had to calculate z->z²+c 32 times, adding up to 9.331.200 total calculations! Let's zoom into the white box again. Yes - a miniature copy of the original Mandelbrot-Set. Let's get the computer working on this one! Wow - beautiful. And all it took was 1024 iteration - for every single pixel. Which makes up 298.598.400 single calculations to generate this image! 5. Iteration … nope. That’s enough. 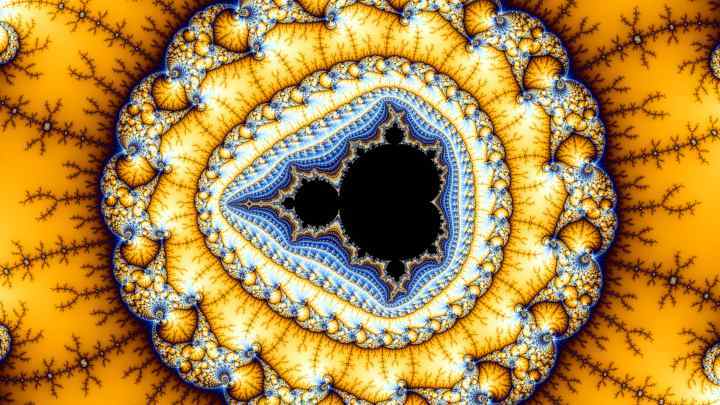 But we need to do all 1024 iterations before it becomes clear that c=-0.272162760214080041615297 is actually part of the Mandelbrot-Set and will therefor be coloured black. No matter who, when or where, when these coordinates are put into Mandelbrots formula, the result will be this exact zoom path and final picture. And just in case you wonder – the current world record for deepest zoom is this with a final zoom depth of 10 to the power of 10002. It took 2 full months to render. Here you can download the location parameters of the above movie to load into Kalles Fraktaler.